We have come up with the idea of an add-on that can help you manage communication between site members. We call it Dating Site Operator. The add-on will be a good fit for a dating and matrimonial agency that works on an international level. Every time people of different language backgrounds are involved, you are likely to require the services of an interpreter. 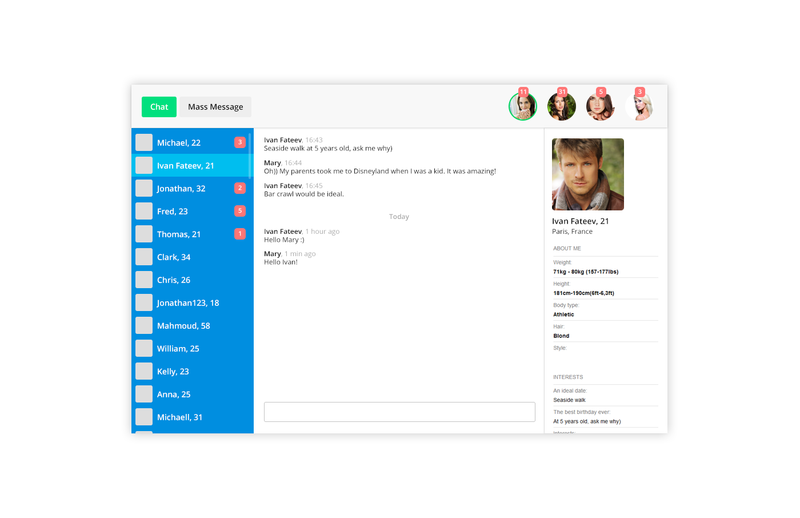 With the help of the Dating Site Operator, the interpreter(s) in your team will be able to converse on behalf of your customers in real time. Then, there is a growing trend among matchmakers to fix/rewrite dating profiles for their clients. Some of them go as far as to access online dating profiles of the clients, with their permission, and to select matches for them based on a quick getting-to-know chat. Dating Site Operator can help here too. The dating site operator logs into the admin panel, then selects the site users s/he will be talking on behalf of. Then the operator uses search filter to select possible matches and starts the conversation. The operator will be able to hold several conversations almost at the same time by switching between different conversations. A short bio on every site member will be available as well as the conversation history.